Cebu Pacific Promo Fares 2019 to 2020: Promo Fares For China and Hong Kong! 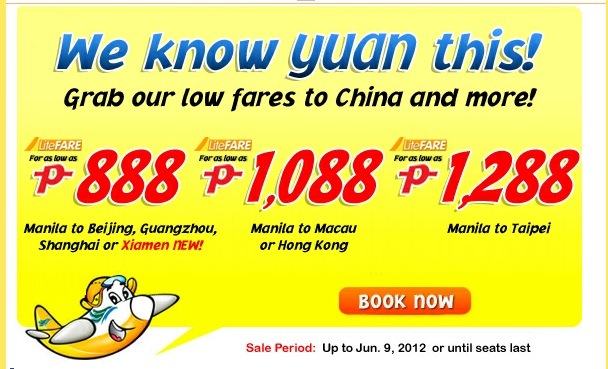 The Philippines’ largest national flag carrier, Cebu Pacific (PSE:CEB) slashes Lite Fares to China, Hong Kong and Macau seats as low as P488 from May 31 to June 9, 2012 or until seats last. For travel from June 15 to September 30, passengers can buy P488 seats from Cebu or Kalibo to Hong Kong. Travelers from Hong Kong can also avail of this seat sale, for direct flights to Cebu and Boracay, two of the Philippines’ most popular tourist destinations. 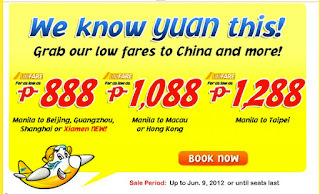 P888 seats are also available form Manila to Beijing, Guangzhou, Shanghai and Xiamen, and from Clark or Manila to Macau. International Lite Fares are inclusive of 7 kilos hand-carry baggage allowance but exclusive of check-in baggage, government taxes, fees and fuel surcharges ranging from $15-$50. “CEB’s trademark lowest fares provide travelers the opportunity to explore Chinese culture, Hong Kong sights and Macau sounds. These fares are up to 78% less than the lowest year-round fare, so we highly encourage guests to take advantage of this sale,” said CEB VP for Marketing and Distribution Candice Iyog. Meanwhile, all-in domestic fares are also available for travel from July 1 to September 30, 2012. P788 all-in fares are up for grabs from Cebu to Bacolod, Butuan, Cagayan de Oro, Clark, Davao, Dipolog, Dumaguete, General Santos, Iloilo, Kalibo, Ozamiz, Pagadian, Surigao, Tacloban or Zamboanga. The same all-in fare is available from Cagayan de Oro to Iloilo; from Davao to Cagayan de Oro, Iloilo, Zamboanga; and from Zamboanga to Tawi-Tawi. Those traveling from Manila to Cauayan, Laoag, Legazpi and Tuguegarao can also buy P888 all-in seats. These all-in domestic fares are inclusive of fuel surcharge, administrative fee, aviation security fee, 12% VAT and 7 kilos hand carry baggage allowance. Flight changes are permitted with P800 rebooking fee and P900 cancellation fee. Iyog added that guests can also book hotel deals through its partnership with agoda.com, the leading Asia-based online hotel reservations company that specializes in the lowest discount hotel prices. Its network includes more than 160,000 hotels worldwide. CEB currently operates 10 Airbus A319, 20 Airbus A320 and 8 ATR-72 500 aircraft. Its fleet of 38 aircraft – with an average age of 3.6 years – is the largest aircraft fleet in the Philippines. Between 2012 and 2021, Cebu Pacific will take delivery of 22 more Airbus A320 and 30 Airbus A321neo aircraft orders. It is slated to begin long-haul services in the 3rd quarter of 2013. In its 16th year of operations, CEB had flown over 60 million passengers. It provides access to the most extensive network in the Philppines, with 32 domestic and 19 international destinations. The airline also remains a pioneer in the Philippine aviation industry by being the first to offer web check-in, self check-in, e-ticketing, Lite Fares and One Peso seat sales.